Israeli Prime Minister Benjamin Netanyahu announced this week that on February 15, 2015, Major General Gadi Eisenkott (right) will be sworn in as Chief of Staff of the IDF (Israel Defense Forces). 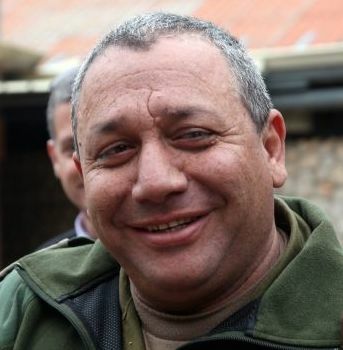 General Eisenkott is well-known in Israel as the author of Israel’s military Dahiya Doctrine, which he first enunciated in October 2008 while serving as commander of the IDF’s northern front. The Doctrine is not well-known outside of Israel, as a cursory glance at even recent Western media reveals. For the West, General Eisenkott is just another Israeli military leader. Within Israel, the right-wing Times of Israel omitted the Dahiya Doctrine from its announcement story. Dahiya? Already well entrenched in Israel’s military strategic structure. Look at the record. The record is unmistakable and distressing. Israel deals with its Palestinian and Lebanese neighbors in terms of total annihilation, a reality known to those Western political leaders who rushed to support Israel’s 2014 Gaza invasion with a mantra dictated from Tel Aviv, “Israel has a right to defend itself”. American leaders, including Barack Obama, Hillary Clinton and virtually every politician facing future reelection campaigns, will have to confront whatever ultimate judgment awaits them, knowing the words, “Israel has a right to defend itself” are inscribed on their eternal ledgers. I do not know what Obama, Clinton, and the other politicians with the power to help, will say. But I do know I will have to respond, “Not nearly enough”. Dahiya takes its name from a Lebanese suburb destroyed by the IDF in 2006. This doctrine was operational in three successive IDF invasions of Gaza in 2008, 2012 and, most recently, in July and August of this past summer. Based on recent history, there is no reason to doubt that future invasions are already being planned. Wikipedia describes the Dahiya doctrine as a military strategy “that pertains to asymmetric warfare in an urban setting, in which the army targets civilian infrastructure, as a means of establishing deterrence against militant use of that infrastructure”. The Doctrine is a reality and so long as Western leaders refuse to shake off the chains of Zionist control, it will continue as a reality. Three times, 2008, 2012, and 2014, the Doctrine has operated in Gaza, leading once again to the destruction of civilian life and structure. 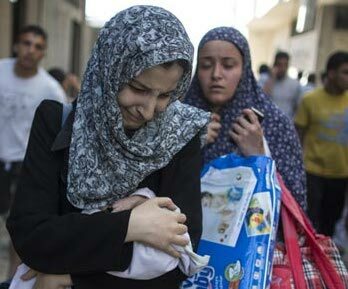 What follows such total warfare are the homeless and the suffering, grieving survivors of the latest Israeli application of the Dahiya Doctrine. “Israel has a right to defend itself?” Israel’s performance and its imposition of its sophisticated military equipment this past summer, were not acts of defense.They were intentional acts of wanton destruction, clearly fitting the definition of war crimes. To those who are paying attention, these acts of wanton destruction continue. Israel’s leaders pay no heed to agreements. They live only by their Dahiya Doctrine. My good friend, New York City-based and Presbyterian activist, Noushin Framke, posted her “Advent Sermon” on Facebook this week. She entitles her “sermon”, the picture below, Sumud in Gaza. Steadfast Hope. Noushin’s “sermon” is testimony to her continued activism on behalf of oppressed people everywhere who yearn for, and fully deserve, freedom. The picture was taken in Gaza this summer. The children are Palestinians. The destruction is from Israel. May God have mercy on us all for sustaining, by our ineptitude and indifference, the on-going merciless Dahiya Doctrine. The smaller picture above of families fleeing Rafah, Gaza, was taken this summer. The picture at top of General Gadi Eisenkott is from Ha’aretz. It was taken by Haron Kaminsky. This entry was posted in Gaza, Hillary Clinton, Israel, Media, Middle East, Middle East Politics, Netanyahu, Obama, Palestinians, Presbyterian Church USA, Religious Faith, War. Bookmark the permalink. Thanks for this careful research, Jim. It is scary and helpful at the same time. And you have Western diplomats right where they need to be. Sooner, rather than later, they must stand up to the Netanyahu government. It looks like the several European countries are getting ready for this. We need to press hard for U.S. action too. So how do we press hard for US action? I agree that we cannot continue to sustain Israel’s war crimes. We must engage our own sumud in the face of AIPAC-supported Congresspersons and disengaged President. There are too many of us looking for the way to stop the “holocaust” of our time – we have to do it. Jim, Thanks for researching the Dahia strategy of deliberate massacring of civilians to be soon planned and executed by (Major General) Terrorist Gadi Eisenkott. I am afraid that this has been Israel’s strategy and doctrine of committing war crimes for decades. As you said, it is based on deliberately murdering civilians in Palestine, Lebanon, and (early on) Jordan, in an attempt to turn the population against the Resistance. They implemented this doctrine, not only by destroying homes, schools, factories, hospitals, electricity plants, bridges, and other infra-structures, but also by deliberately murdering civilians, including children, families, in an asymmetrical manner, as in Gaza. The way I see it, there is another even more sinister reason for Israel to escalate its outright war crimes. It realizes that such crimes will almost surely bring retaliations by resistance groups. And Israel will use it as an excuse to conduct even more massive ethnic cleansing, using its latest tyrannical, racist laws of evicting “non-Jews” from Palestine. Let us not forget that Israel’s goal is to have One State, NOT two states between the River and the Sea. To this general, defense means total annihilation. Israel has atoms bombs. The only middle eastern country that does. it will use them on Iran some day. Because AIPAC and the rest of the Israeli Lobby run our mideast policy, nothing will change (they have billions to buy elections) The Democrats have already ordained Hillary Clinton (warmonger and Israel Firster in chief) as their candidate, and the Republican choice will be as bad, so we will remain helpless in our own nation and the US and Israel will remain the nations that are the most destructive, and the greatest threats to world peace. Our invasion of Iraq has led to ISIS. So we have ISIlL and JSIL (Jewish State in the Levant) wreaking havoc on their surroundings. action from the sitting President Obama. Myths , when he was a Free man at the U of Chicago. Nump and support Apartheid blindfolded. Thanks for including my Advent 1 “sermon” Jim. 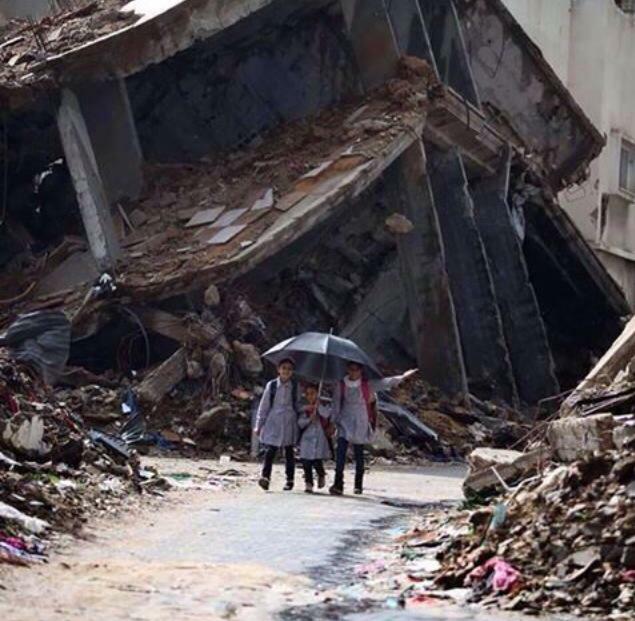 There are a lot of pictures of Gazan children coming across my twitter feed at the moment, and this one of the 3 girls sharing an umbrella was very poignant for me at this time as we await the light to enter the world of darkness. When I was at the recent Open Hillel event held at Harvard in October, one young woman who is a senior at Claremont and had flown across the country to attend, told me she had served in the IDF and grew up an “ardent Zionist” but had an epiphany only a month before coming to the Open Hillel event. She said she found herself arguing with more conservative Zionists than herself over who was to blame about the deaths in Gaza, and found herself repeating that over 500 children had died in Gaza. All of a sudden, she said, “I found myself doing math with dead children.” And that was it. She stopped and got off the Zionist train.